Meanwhile, take a look at the latest updates of the overall medal tally right here. The semifinals in the Kayak Singles and Canoe Doubles will be conducted later in the day as the three races will have Indians battling the waters for a spot in the final matches. Stay tuned to Sportskeeda for all the live updates from Jakarta-Palembang right here. The scoreboard at the end of the Heat 1 race. The dou of Prakant Sharma and Jamesboy Singh have done it!! 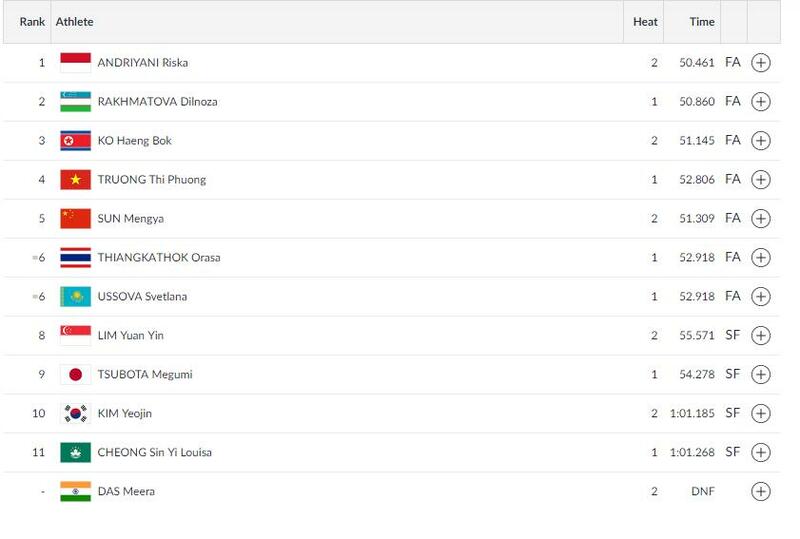 They finish fifth in the Heat 1 of the race and have qualified for the semifinals. The Canoe Double (C2) 200m Men's Heats are underway! Next up we have the Canoe C2 Doubles 200m Men where the duo of Jamesboy Singh and Prakant Sharma will be heading out! AND NAOCHA SINGH IS THROUGH TO THE SEMIS! And with that he is through to the Semi finals to be played out later today! Singh ranks 7th in his heat and covered the distance in 41.151! He enters the semi finals and keeps India's medal hopes alive! AND NAOCHA SINGH ALSO DOES IT! The kayakers have set forth! And it's time for Naocha Singh to take to the waters! Let's see if he can go closer to getting a medal! Next up we have Kayak Single K1 Men's 200m where Naocha Singh will be competing! Ragina will be competing in the semis later in the day. Kiro Ragina qualifies for the semis! Ranking 6th in her heat, Ragina clocked the 200m dash in 51.239 to make it to the semi finals! And as predicted, Ragina Kiro does not let us down and qualifies for the Semi finals! She has began her Kayak 1 Singles 200m Heats! Ragina Kiro is quite the veteran at 34 and shouldn't disappoint! After that sad start to the day, we have Kayak 1 Single 200m Women's event where Ragina Kiro will try and lift our moods. Das finishes at the bottom of the list for she didn't start her race. Naturally she could not proceed anywhere near the top slots as she didn't even start. In a very odd and bad turn of events, it reveals that Meera Das failed to start her race. AND THE SECOND HEAT HAS STARTED! It is time now for Meera Das to step into Heat 2 and work her way forward! Uzbekistan covered the 200m in 50.860! The first heat has come to a close with Uzbekistan and Vietnam topping the list! And with that the heats have begun! Das has been placed in the second heat and she will venture out into the waters real soon! Beginning the day will be Meera Das as she competes in her Canoe Single C1 200m Sprint heats! A very good morning to everyone! It's the penultimate day of the Asian Games and the action has picked up dramatically! India will look to add to its medal tally on Day 13 and surpass their all-time best medal haul of 65. In the 4 Canoe and Kayak finals yesterday, India failed to make a mark and come in the top 3 but still have the chance at winning medals here as we start with the Canoe 1 C1 300m Women Heats where Meera Das will be representing India. Following that, we have Kayak Single K1 200m heats where Ragina Kiro will take part! In the Kayak K1 200 m Men's Single it will be Naocha Singh and lastly, there will be the C2 200m Doubles Heats where Prakant Sharma and Jamesboy Singh will try to edge nearer to bringing medals for the country.